Growing up, I remember comic conventions always being a big joke on T.V. I remember a few episodes of The Simpsons where the family went to a comic convention, an early one where Bart goes dressed up as Fall Out Boy from his favourite comic Radioactive Man, and another where the family goes for some unrelated reason except to make fun of the geeks there. Comic Conventions were portrayed similarly on other cartoons or television programs: the cool protagonists going to a convention for some plot related reason and finding a building filled with strange basement dwelling (mostly male) nerds stuck in the fantasy worlds they loved so much. This kind of behaviour spread to how many people viewed nerds and geek culture, seeing conventions as strange events for the lonely weirdos of the world and making any mention of conventions or comic books a joke. I know based on the stereotypes I saw on T.V. that a younger me would never have seen myself attending conventions as much as I do now, but that’s because something changed. I don’t know exactly what it was, but it became cool to be a nerd and geek. Maybe it was the internet and streaming and how more people could watch and talk about their favourite shows and movies to people worldwide, maybe it’s the major popularity of superhero movies making comics and their many iterations interesting again, but suddenly it wasn’t a bad thing to like things that were made fun of. Fanfiction and fanart were things that were starting to be talked about and shared online (especially on Tumblr), being excited about television shows, books, and fictional couples formed huge debates (Team Edward or Team Jacob anyone? ), and dressing up as your favourite character from a book, T.V. show, movie, video game, etc. wasn’t strange but a craft. And I never could have predicted how much I’d love it all. The first convention I went to was Hamilton Comic Con, a local convention which takes place in my city each fall. I didn’t know what to expect and I was a bit nervous about the whole thing. I still had those fears of being made fun of for going to a convention like those fictional geeks on T.V. and had no idea what a convention was like. I went with my sister and one of my friends and we all decided to cosplay which did nothing for my nerves. I didn’t want to go all out like some cosplayers do, partly because of nerves and partly because I’m cheap, so I went as Cosima from the show Orphan Black. And of course I loved the convention! It’s a pretty small one, which was nice for my first convention, and it gave me a chance to explore and see what a convention was like. Since then I go to about two or three conventions a year: Toronto Comic Con, ConBravo, and FanExpo, and yes I’ve also cosplayed at each of them. I’ve been main clones from Orphan Black, Tina from Bob’s Burgers, Mabel from Gravity Falls, and this past weekend I was a hamster at ConBravo. It started as a joke the night before this past Toronto Comic Con during a sleepover. We were sugar high on Japanese candy and watching Hamtaro when my friends and I joked that we should do a group cosplay as some of the hamsters for a future convention. This joke quickly turned serious as we began claiming hamsters and planning cosplays. I chose Penelope, the little baby hamster that for some reason only says “Okwee Okwee” (I guess that’s baby talk for hamsters) and also strangely wears a cloth over her body because she’s shy. I don’t think I’d say Penelope was my favourite character from the show, but she’s adorable and I thought of a good outfit for a cosplay for her. We were doing a humanized version of everyone’s favourite Ham-Hams so I decided to buy some brown shorts (which was easy enough to find at Talize) and a yellow poncho (not so easily found). However, I am notoriously lazy when it comes to cosplaying and didn’t realize it would take a MONTH IN A HALF TO GET A YELLOW PONCHO FROM AMAZON!!! So I went thrifting with some friends in our cosplay group and found some yellow curtains and my dear friend PizzaDogCosplay sewed them for me since my sewing machine doesn’t work. We all got our cosplays ready and met at the Con and as usual, it was a lot of fun. ConBravo is a convention that focuses on Youtubers and video games so there isn’t a lot there that piques my interest in terms of guests. Last year Nostalgia Critic was their so he was exciting to meet, but this year it was more looking around the dealers area and Artist’s Alley (my FAVOURITE part of any convention) and hanging with friends. I bought a lot of cool things from artists, took some awesome pictures with my fellow Ham-Hams, and was pleasantly surprised by how many people recognized our cosplay (though we were also repeatedly mistaken for mice). And when one convention ends it’s time to prepare for the next. FanExpo takes place in Toronto at the end of August which means I have cosplays to plan (still haven’t bought everything) and money to save. I’m going with a large group of friends this year, and have a hotel booked with half of them which should be a fun time. 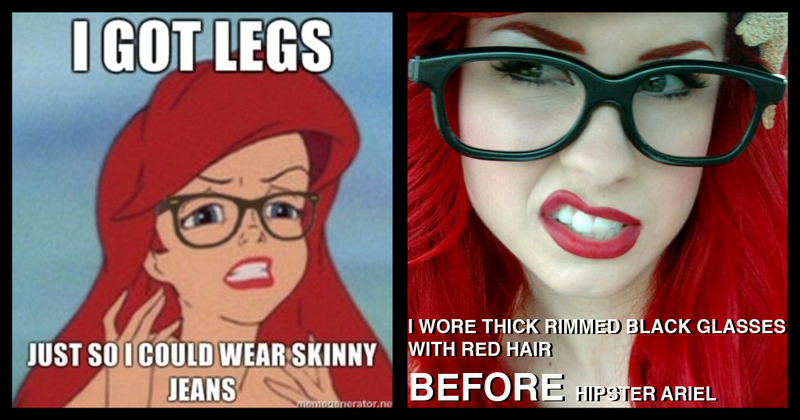 And I know what I’m going to be dressed up as: Sailor Pluto based on a drawing by LittlePaperForest and Hipster Ariel from Disney’s The Little Mermaid. I’m excited for these cosplays because they’re the first ones I’m actually putting a bit more planning into, and buying wigs for, so we’ll see how it turns out! Overall though, I love going to conventions and I love that the attitude towards them has changed. Sure, some of the jokes and stereotypes towards them still exist, but can anyone really say that nothing in nerd/geek culture excites them? Are there really people who aren’t passionate about fictional characters, fantasy worlds, favourite books, movies, and T.V. shows enough that they could talk about it for hours on end? If they exist they don’t sound very interesting, and if liking something passionately makes me a nerd/geek then I guess that’s what I am.